Means it begins to teach that the angels have a reality for us. We are asking for the eternal heart to open. We are asking for the Divinely Lights to open, then everything in Creation has a secret for us, so many things will be linked to this hour glass movement. 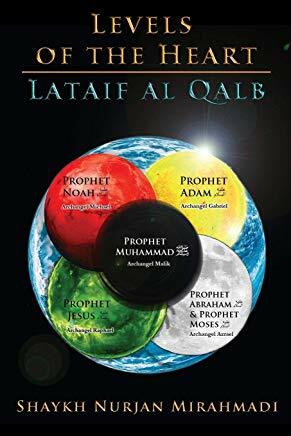 Once we begin to study it or if we are interested in it, we can see from the Qalb to the Sir to Sir Sir to Khafa and Akhfa. Just at the level of malaika (angels). Then Sayyidina Jibreel comes and teaches in the yellow light those are secrets from Sayyidina Jibreel (as) and the secret of knowledge and why he was responsible for bringing prophecy to all the prophets. They begin to teach in the world of light, that in the initial stages, he’s coming and going, coming and going, but if you are reaching a station of sincerity then why to come and go? Because you can understand from the world of light, it is no longer physical world; when you stand there and I stand here we have two separate presences. 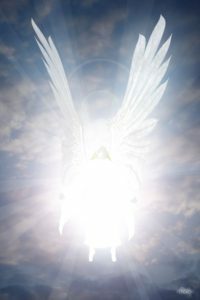 In the world of light with the angels the light comes into the reality of your soul, the beginning and ends of these lights are no longer known; light melts into each other. 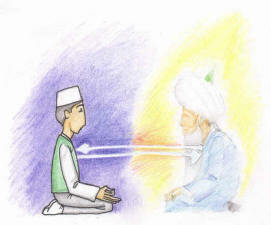 Then Sayyidina Jibreel begins to deposit his lights upon your soul. 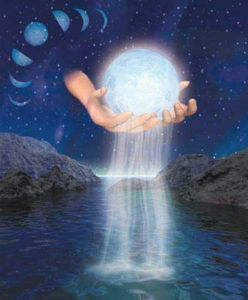 The more light he deposits, the more light he deposits, like an agency opens within the soul for Divinely Knowledges. It is no longer necessary for him to keep traveling, he merely opens an agency within your soul and begins to deposit, (like) what they call in agriculture is grafting. He puts a little bit of that light and it begins to multiply, begins to move within the reality, as long as we are keeping the soul purified and clean. Qul jaa al Haqq wa zahaqal batil means truth and falsehood cannot occupy the same space. So once sincerity is granted, Allah grants sincerity, the soul is trying to purify, and it can’t keep doing good and then bad, good and then bad, this light will leave, it can’t occupy that same space. So why Allah (AJ) asks for it to be sincere is that through sincerity and contemplation, they begin to open the channel. When they beging the channel of connection, that channel will begin to guide that: don’t do that, do this, make your connection, these are the channels, these are lights and energies, and these are the isharat (signs), where Allah (AJ) makes them to be mahfuz (guarded), because now the connection of the soul is open. So Sayyidina Jibreel comes and begins to deposit light. This is the light of knowledge. 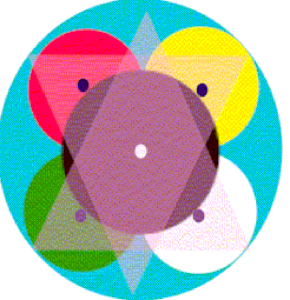 These are the lights of the reality that begin to open within the servant’s heart. Sayyidina Mikhail comes and begins to teach and each has an infinite understanding of knowledge. 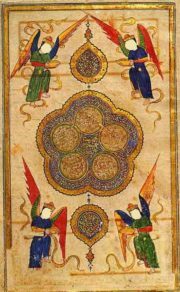 Sayyidina Mikhail begins to come at the Sir, the secret [Second Station], and says, “I am the angel of war and the angel of sustenance.” Means that every article of understanding when you read the levels of the heart, from Mawlana Shaykh’s teaching, begins to open its understanding. The ulul amr are granted permission and Sayyidina Mikhail begins to dress the soul. He begins to put that light into the soul: that your sustenance I am now in your soul, I am with you. Means I am now going to control your sustenance that is coming to you. You are going to eat from your Paradise realities. You are going to drink from your Paradise realities. We are going to sustain you from your Paradise realities. Our agency our office is already open within your soul. That is what it means to be dressed with angelic lights. They are the ones coming and supporting and everything is essential. Means for knowledge to open in the soul Sayyidina Jibreel’s lights must be there, otherwise they are speaking from their head and from books they read. When somebody speaks from the book they read written by professors at school you immediately pass out because it is from head, head to head. What they [awliya/Saints] are talking and teaching and give permission to teach is from the level of the soul, an energy from the soul. The angel begins to come and say that, “I am going to deposit that light, my agency is within your soul, whatever sustenance Allah wants that agency is there. What do you need, you will receive from your Paradise reality. My light will assist you in your struggle against yourself and your demons.” That light begins to emanate within the soul. Then Sayyidina Azrael at the Sir Sir [3rd Station], comes and begins to teach that: if you are truly contemplating and meditating you are now entering the maqam of mawt qablal mawt [Station of dead before death]. We are not Arab so sometimes the Arabic is off but we are taught in English and our audience is for a western audience, they didn’t send us to do a job in Saudi Arabia. We are taught in English and speak in English and every now and then they give isharat to throw some Arabic out but it is not very good. Don’t pay attention to that point. The station of ‘death before death’ means so much of this light is coming, so much of this light is coming from your Paradise reality. If it is coming into your body you are not from this Earth any more, your contract has been flipped because what comes to this physical body is a very small drop of the soul. The size and age and magnificence of the soul is not something that can be imagined. If you could imagine it, in one time they may show you with your soul standing and the whole Earth fits within the palm of your hand, its size and magnitude is something unimaginable. It means like a telescope is reaching you, the ulul amr are sending you lights from where? From the obedience of Prophet (saws) and Prophet (saws) is sending from where? The obedience of the Divinely Presence, and begins to send these lights. Sayyidina Azrael begins to describe: you are dying, you are more dead than alive in this world. Your desires for this world are no longer and you walk amongst people but you are not from them, we are going to teach you how to die before you die. Laa ilaaha ilAllah, laa ilaaha ilAllah [There is no God but Allah] they focus laa ilaaha ilAllah on their lataif and the body will shut. They enter into a state of death and can revive with Muhammadun Rasulullah [Prophet Muhammad (saws) is the Messenger of Allah]. Laa ilaha ilAllah, laa ilaha ilAllah, laa ilaha ilAllah die, and Muhammadun Rasulullah come back. It means two noble gates, you have to open and purify. They can’t let you just send the body out. It means it has to be a very noble and clean sending, come back very noble and clean, not to contaminate, not to dirty anything, in the presence of Sultanan Naseera. 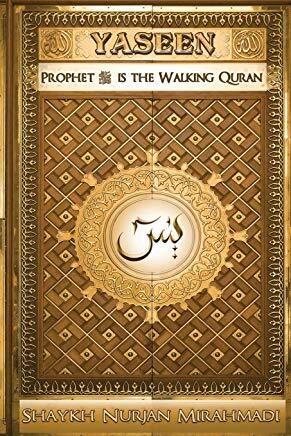 Means go from the gate of the Siddiq, enter from the gate of the Siddiq to the Sultanan Naseera, an authorized sultan. Sayyidina Israfil begins to teach us: if he (Sayyidina Azrael) is teaching you death, I will teach you to resurrect. That once the station of death is coming, I teach you how to resurrect your soul into the Divinely Presence. So for all of that, if you look at this (diagram) this was the drawing of castles in old England. Look at the old castles, they had the main palace for the king and four towers for protection. Four towers because it was symbol of the Heavenly Kingdom. In old movies you see the king’s palace and four towers and surrounding the palace was a moat for the protection of the palace and you couldn’t get to the palace unless a little sirat al-mustaqeem, a little bridge came, because in the moat there were crocodiles to eat you. They made all the palaces with that reality. Allah (AJ) says: why do you think this is ajeeb (strange), you saw it in all your movies, because We said the Kingdom come My Will be done on Earth as it is in Heaven. 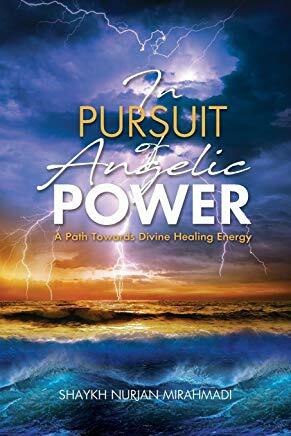 It means in your heart, “Make My Heavenly Kingdom, My angels will come.” These are the archangels and under them millions and billions of angels. 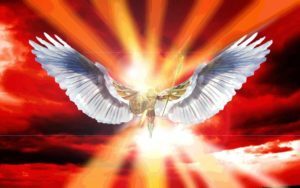 It is not something that can be numbered of that support, but what we need are the archangels who come to fortify and make Allah’s Kingdom within the heart. This is the Ark of the Covenant. We have some other family members who are in search of an Ark so they can be granted a victory in battle. They are about to blow up many structures, hoping to take that Ark and they want to take the stones and the Tablets of Nabi Musa (as). They think with that Ark they are going to be granted victory. That was an artificial Ark until the arrival of Sayyidina Muhammad (saws). The Ark, means the vessel of the covenant is the holy heart, the covenant of Allah (AJ); nothing in Heavens and Earth can contain it except the heart of the believer. Allah (AJ)‘s holy covenant had to arrive with the seal of Sayyidina Muhammad (saws). From that point on the heart of the believer is the covenant of Allah (AJ). It is carried by the archangels, Sayyidina Jibreel on one side, Sayyidina Mikhail on the other side, Sayyidina Azrael and Sayyidina Israfil are carrying the soul. They are carrying that reality. In the center of its [heart’s] authority and power is Sayyidina Malik. Sayyidina Maalik means he brings the enforcement of jahannum (hellfire) onto that soul. The greatness of our Paradise is based on its protection. They are showing now about the Heavenly Kingdom and how it operates. 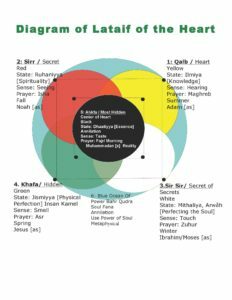 Now we understand, for all of this to be operating [Shaykh pointing at Level 1 to 4 of the Heart diagram], there must be an essential enforcer; there must be Pentagon, and a NSA (National Security Agency). There must be a power that is at the center of it, otherwise how do you know that this angel is working correctly [Shaykh is pointing at the Station of the Qalb, the Sir] How do they know that this angel is working correctly [Shaykh is pointing at the Station Sir Sir and Akhfa]? Why? Because amrullah, the order of Allah (AJ) comes directly to Sayyidina Malik (as) and immediately dispatches, yaa Jibreel, did you do what you were told? Sayyidina Mikhail, did you do what you were told? Sayyidina Azrael and Sayyidina Israfil, did you do what you were told? Means the center of authority and center of power, and the enforcer is Sayyidina Malik (as). Allah (AJ) is saying for these lights and these realities to open upon the soul he must be protected because Shaytan is going to go after him. They say these realities can’t open and these dressings can’t come until Allah (AJ) gives salamun qawlan mir rabbir rahim because this is Yaseen (saws), this is the heart of Prophet (saws), this is the heart of Holy Qur’an, this is the heart of Sayyidina Muhammad (saws). For this to open Allah has to grant salaamun qawlan mir rabbir raheem, a word of peace from Rabbir-raheem. When Allah (AJ) grants salaam means all the angels are trying to run after that servant to be of service because allah (AJ) has granted His kiss of love that: I am rida, I am satisfied. Prophet (saws) grants: I am satisfied, all the Heavenly Kingdom come to support. With that there must be a power, there must be an authority, there must be a protection. Sayyidina Malik (as) brings his flag of protection over that servant and says, “I am now giving to you all my zabaniyati that you merely request and these zabaniyati will be unleashed upon Earth.” The dragons of Hellfire will be released upon Earth, if they give permission to one Wali (saint/friend of Allah). Imagine the sultan of Awliya (king of saints) what they have? 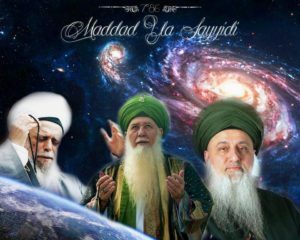 When they talk about that they are not scared, when people came to Mawlana Shaykh and described black magic he was laughing very much. For us it is very scary because Shaytan can cause a lot of problems, but you are talking about the masters of this reality. At their disposal Allah (AJ) has given them an authority of Sayyidina Malik (as). 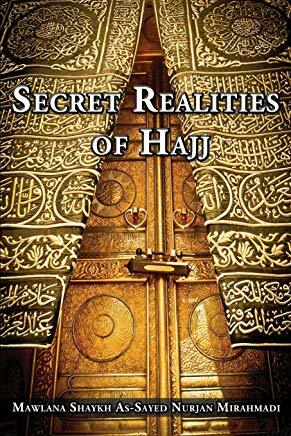 That merely make your request, they are taught a Zikr, and when they begin to make that Zikr to make their connection and begin to ask, an infinite number of angels of jahannum can begin to enter with a fire and fierceness that nothing can be imagined. Do you think that there is a Shaytan that would try to stand against them? If they are one or two or five or six, an infinite number coming from Divinely Presence, that they merely look and they are devoured and taken away into pits of difficulty that cannot be imagined. Means there must be an authority, there must be a flag from Siffatul Qahhar, [one of Allah’s names], Allah’s Qadr and power must be upon them. Sayyidina Malik must be an authorized light upon them. It is not a coincidence that that light is black and it represents a reality of the Ahl al-Bayt, the reality of Prophet (saws), the reality of annihilation. It is for all that light to be opened, for all that reality to be opened. Then these are the realities of annihilation. This was just the understanding from Mawlana Shaykh’s teaching for the angelic reality. Everything has an understanding in these lataif. Subhaan Allahi (at Qalb), walhamdulillah (at Sir), wa laa ilaaha ilAllah (at Sir Sir), Allahu Akbar (at Khafa), laa hawla wa laa quwwata illa billa hil `aliyyil azheem (at Akhfa). Means that in every reality and every depth of the lataif there is an understanding. Once we begin to want to study it and focus on these lights the shaykh merely begins to open that reflection. When we see ourselves in that yellow light and studying the understandings of the Qalb already having made a connection with Mawlana Shaykh. We see ourselves in that yellow saying, “Sayyidi dress us from the light of the Qalb,” and begin to see a light from his heart emanating like a projection TV. This is also like the old style projection TV. He will send a yellow light, a yellow light, a yellow light, why? Because this is now the ocean of `ilm (knowledge) dressing the self. They begin to send a red light, they begin to send the white light, they begin to send the green light, they begin to send the black light of annihilation. It means we have to want it, and study it, connect and meditate, and and ask now to enter within it. But it is not something that you read from the outside, don’t do any meditation and hope that you are going to gain an understanding of it. This is of an infinite capacity that must dress the soul and the reality of the soul because now you are talking about qalbun mu’min baytullah. This is the house of Allah (AJ). It has no beginning and no end, infinite in its capacity and very difficult to enter in. Subhaana rabbika rabbil izzati `amma yasifoon wa salaamun `alal mursaleen walhamdulillahi rabbil `aalameen. Bi Siri Muhammad al-Mustafa, bi Siri surat al-Fatiha. 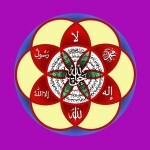 Al Raheem is the Power of Al Rahman all Creation its Atoms seeking ” Salams from Rabb al Raheem”(Holy Quran 36:58).